I've had a number of hospital appointments this year. That many, I've actually lost count! October saw me have another two and I thought I'd share how I've got on. Last year, I shared a couple of posts sharing how I had found a lump on my jaw. It wasn't something that the consultant was too worried about but he arranged a follow up appointment a year later. This week was the week I saw him and finally! Some good, health related news. The lump is bone and nothing to be concerned about in itself. It is, however, sat directly on a nerve and if it were to be removed, there is the possibility I would be left with permanent nerve damage. The good news is that the consultant is happy to leave it for the time being and I don't need to have it removed. If the sensitivity reduces any further then he will be happy to remove, saying that I will be in no worse a position. 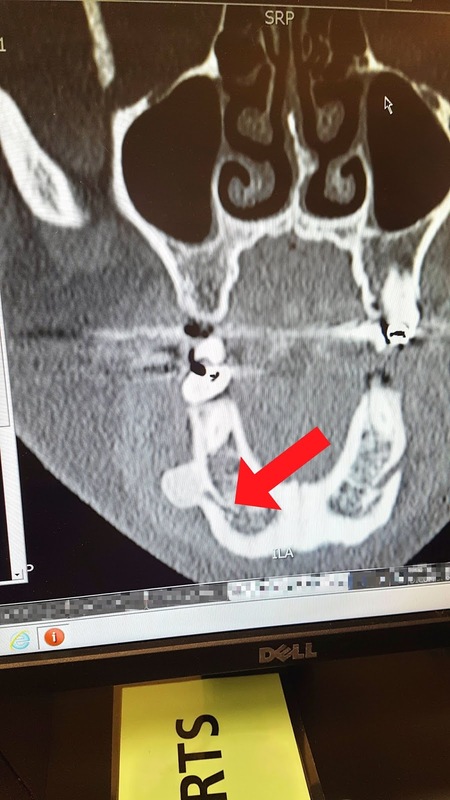 I'm so relieved about this, I can't tell you, particularly as he told me how it would be removed - either burred or chiselled off, under local anaesthetic! This time I thought to ask if I could grab a snap of the CT image. Its not the best quality I'm afraid but you can see the lump sat directly over the nerve. Ah. My stomach. Where do I start with this one?! This year I've seen several Doctors and Consultants, all of whom have had a different opinion. There was the almost hospital admission back in March. The times I've been in so much pain I've thought I'm going to pass out. My gallbladder, pancreas and liver have all been checked. Blood tests have been done. I've had scans and an endoscopy. I've been sent from the gastroenterology department to the gynaecology department, who I'm still seeing. At my recent appointment they confirmed that the latest blood tests and swabs that were done were clear. What was surprising though was that my hormone levels were all normal and it seems that I was originally misdiagnosed with PCOS, despite having many of the pointers, the consultant seemed to be cross that I thought I had PCOS. I had to explain to him that it was my Doctor who had told me that I was! From what I can gather, my hormones must have been fluctuating back at the time of the PCOS blood test. I had a little lesson in women's biology and he said to think of the pelvic region as being a V shape with the uterus, ovaries etc at the bottom of it, with the bowel and intestines sitting on top. Because they are in close proximity, stomach issues can sometimes be blamed on gynae issues and vice versa. I've been given a course of medication to take for the next three months to treat IBS and then I have to go back to report on how I've got on with it and whether I still have the pain. Despite having definite gynae (period)... difficulties, I'm pretty sure that they aren't causing the pain as the pain is too high up. With regard to periods, he wasn't overly helpful. There's no way for me regulate them other than contraceptive pill but I'm unable to take the particular type needed (combined, I think) because I have migraines. I've spoken to them about the possibility of a hysterectomy but the consultant was surprised at this and asked what I would gain from it! Hmmm.... well, no periods for a start! We've had our children, our family is complete. He briefly entertained me and said that I would need to be sterilised first to prove that I'm serious about having it done, which seems to me to be a complete waste of NHS resources. When I go back for the next follow up, he'll review again and said that he'll make a decision whether to take a look with a camera to see if there are any signs of endometriosis. Failing that, he said it will probably be put down to chronic pain. I don't want to dwell on that too much because I won't lie, it does worry me when I think about being stuck with this pain.